Here is another new textile design and dress i've been dying to reveal. 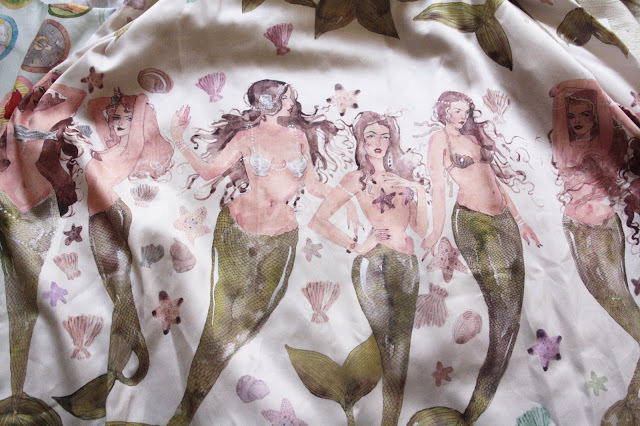 This one is adorned with mermaids, frolicking upon a sea-foam background with shells, starfish and lots of wispy tendrils of hair. 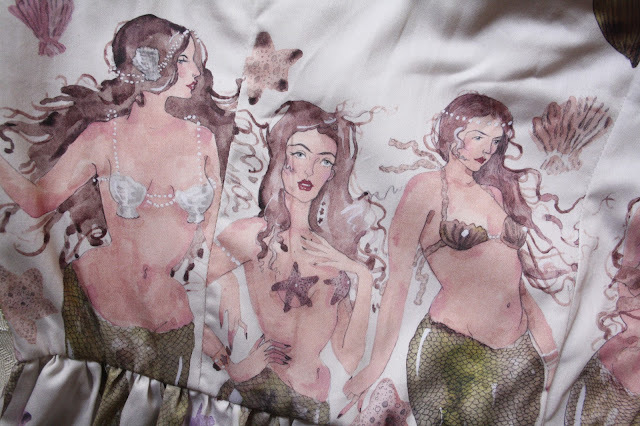 This design started out as a long watercolour painting of a row mermaids, hair all intertwined, so it's wonderful to see them all laid out upon fabric and stitched into a wearable garment. This particular dress was commissioned by the Audrey Grace boutique. For information on how to order your very own mermaid dress, please email me. How are you? we have not been in touch for a long time! 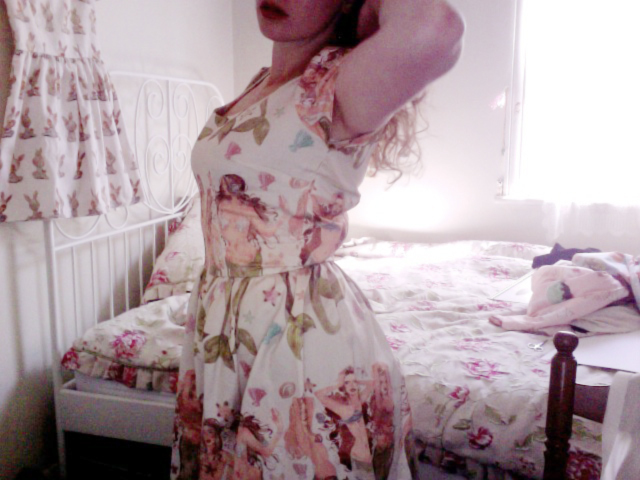 Wow, this dress is wonderful... (and all the others too!) You really create the best patterns! Caitlin, you are so very talented! Your work never ceases to amaze me! well it's true that i'm equally in love with your work! so translucent and edible looking, sweet like candy. 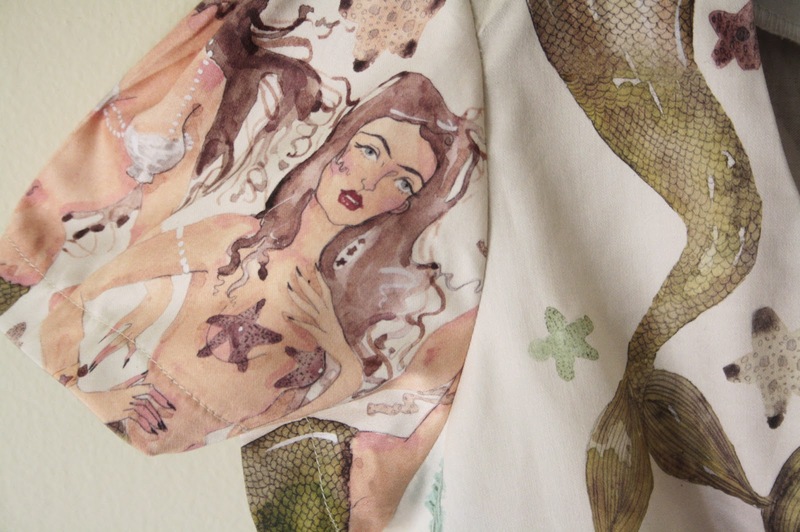 This print is SO GOOD! Thanks a million! 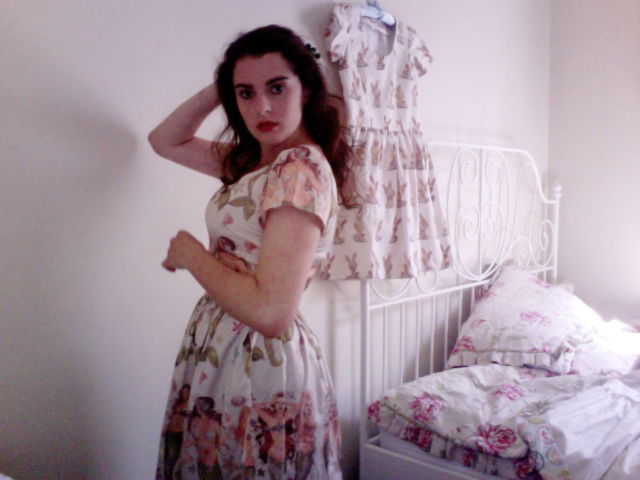 I've often seen your love for printed dresses on tumblr, so this is such a great compliment to receive! Is that a wee bunny dress I see hiding in the back?? Indeed it is! That dress will be released tomorrow morning. So I finally followed the link trail from tumblr and found your blog--your work is so so stunning and charming, I can't even articulate it! I'm in love with your work and will dream of owning one of your dresses forever now! Thanks Michelle, that is absolutely kind of you to write. Caitlin you are pure magic! I owe it to my childhood self to get this dress, like you I've been long obsessed with mermaids but my obsession stems from living in the driest and most desolate of towns. Forever longing to be near the ocean and imagining what my town looked like a million years ago underwater and what it would look like when it is once again submerged. Hello Crissy. 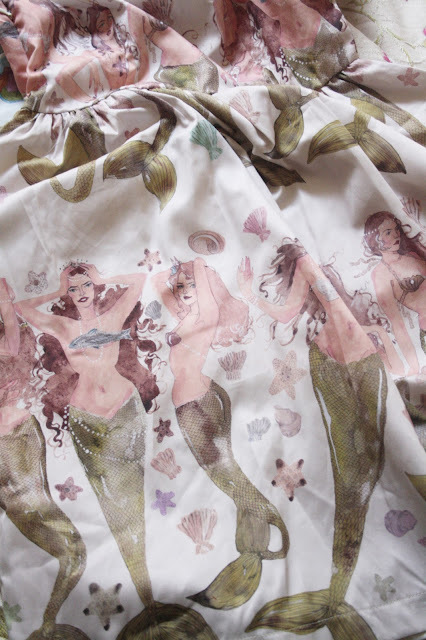 Yes, funny that our love for mermaids stem from entirely opposing locations and situations. I can definitely see why living somewhere arid would lull you into longing for an underwater fantasy. Oh my goodness. 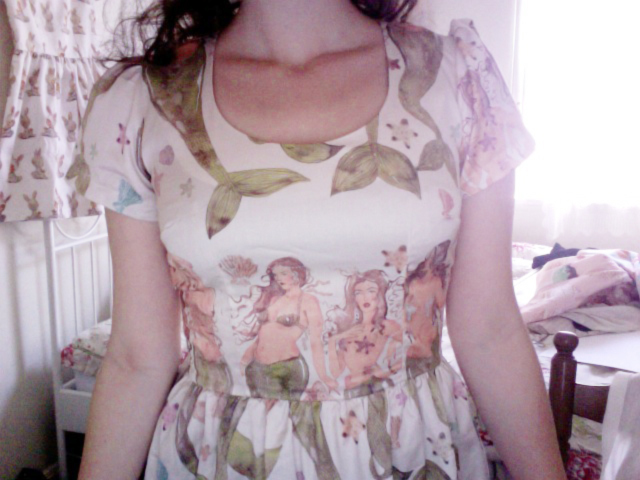 I love this dress so much. 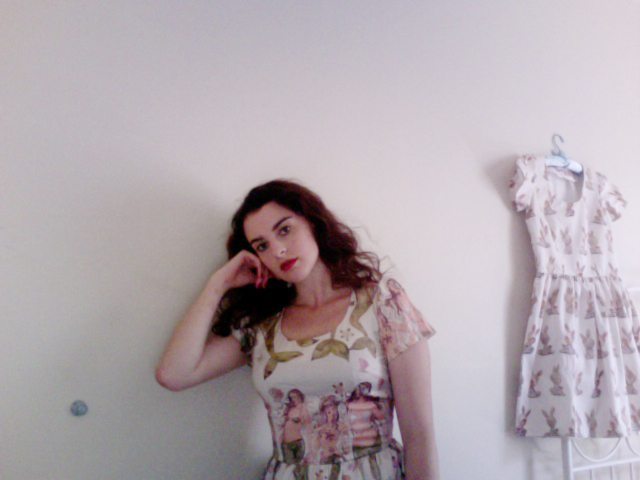 Do you make dresses for people? Thanks Sasha. Yes, these dresses are made to order. In fact, i think i see the email you sent just pop up in my inbox! MY GOD I LOVE THIS. I was thinking of buying the scout badge dress but this dress has taken that idea over. Do you make them in chubby girl sizes? I've had some requests for bigger sizing lately so i think i'm going to branch out and try to provide that. if you can email me at caitlin.shhh@hotmail.com i can send the standard measurements and such through. Such a beautiful dress. Love your blog! well you appear to be a a darling angel - how happy that would make me! How beautiful is this?!?!?! How much do you charge to make one? 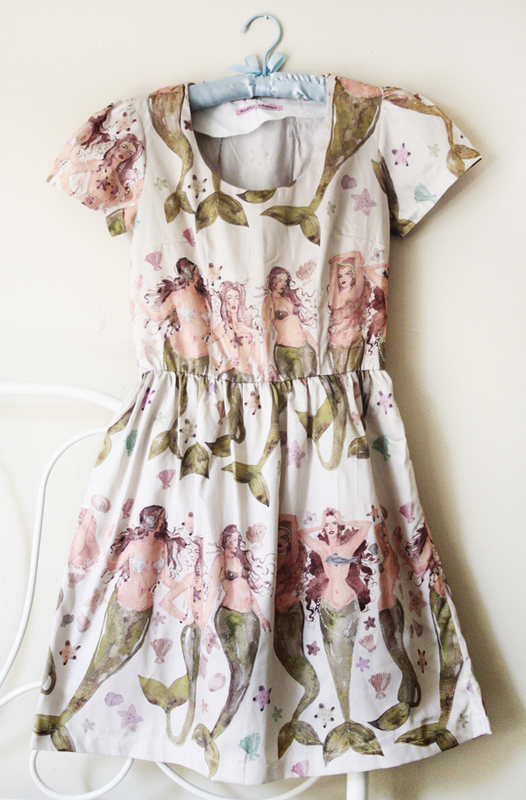 the mermaid dresses are $150 AUD plus postage.